Excellent location and helpful directions from the owner. House was clean and welcoming (including the bottle of wine on the kitchen table). Kitchen was well stocked with crockery and utensils - so no problems in catering for large numbers. Furnishing and decor was comfortable and in good condition, but also informal enough for a family gathering with 3 toddlers and 4 teenagers. Owner was very helpful including re-directing the wrongly delivered online grocery shop to us, and sending back a precious baby bowl and spoon which we inadvertently left. Only feedback would be that bathroom / shower provision could have been improved (i.e. more of them) - but understand the limitations in a 300 year old farmhouse. An excellent property in an outstandingly beautiful location - all the rooms were comfortable with a large lounge and a well equipped kitchen which was able to seat all guests. Rooms were warm even with the outside temperature down to minus 5 (on the 1st and 2nd of February). Local pub within five minutes walk was also very friendly with great beers and local ciders and good food. A very nice circular walk to Stoke Lacy to take in the Plough (Grumpy Barman/Landlord) was enjoyed by all. We very much enjoyed Litte Cowarne Court as a venue for our family get together. The facilities throughout were first class with good sized rooms, very comfortable beds and plenty of space for us all. The large kitchen/diner was a most welcoming room and well equipped with everything we needed. We would not hesitate in going back again if we were back in that part of the world. I had a family weekend in the cottage to celebrate my 80 th birthday. There were 12 of us ,three generations.We were all very comfortable. We prepared all our meals and the cooking equipment and table ware was all in place for our use. Thank you for a weekend i will never forget. We had a really lovely stay at Little Cowarne Court, it was perfect for our large group which included lots of kids! The bedrooms & bathrooms were very clean and the beds were really comfy. The lounge & kitchen are well stocked & had everything we needed. Sarah was a great host and immediately sorted out a problem we had with a freezer. It’s in a beautiful location & the kids had lots of fun playing in the garden & the play barn. Had a wonderful stay at little Cowan court. A real home from home (except tidier! ) we had small children with us so perhaps could consider a table dryer as the weather was a bit wet at times and couldn't keep up with the clean clothes but managed when the sun came out..
Lovely weekend in rural location. We had a great weekend in little cowarne court. Ideal for what we wanted and Sarah was extremely helpful. Lovely rural location, garden beautiful! The pub up the road was great too. Lovely 17th century farmhouse with plenty of bedrooms for a family gathering, super long kitchen table (too hot outside for lunch!) and also garden table in pretty garden in a rural Herefordshire setting for evening suppers. Nearby Hampton Court Castle garden highly recommended for all ages. Mobile phone reception variable, but landline available (and used to order delicious and reasonably priced meal delivered by Lin's Wok in Bromyard). Owner Sarah Mulroy very friendly and helpful. We have stayed at Liitle Cowarne 3 tines. It is always clean and well equipped, with a comfortable feel. It is well run and the owners are so friendly and accommodating. The location is a little remote but just added to the charm for us! The only down side is that the living room furniture is a little tired, that said I would describe this cottage as excellent value for money. Very good house for meeting up with friends. There were 17 of us (8 adults and 9 children). Lots of space and house well equipped, with great Kitchen and dining area. We enjoyed a lovely week with 16 people (10 adults and 6 children) and a dog. Very comfortable! Very nice pub close by. Little cowarne court was perfect for our group which consisted of 15 adults, 2 children, 3 babies and 3 dogs! It was v spacious and had large communal areas for socialising. There was a lovely pub which we used several times about a 15 minute walk away. We would love to visit the house again in summer and would definitely recommend it! Warm and comfortable period property in quiet rural location. Lovely old property which was warm and comfortable. Extremely well equipped kitchen. Lounge needs a wood burning stove in the fire place! We recently held a family get together at Lottle Cowarne Court and the Tack Room. There were 20 of us altogether and the two properties with all the wonderful outside space too, worked perfectly. From the start, Sarah was fantastic with communications and helpful advice and the properties themselves suited us down to the ground. Everything we needed was on hand, and catering etc even for a large group, was easy in the large kitchen. The weather was fantastic so we were able to enjoy the garden and the local area for walks and the three dogs had a great time too! We stayed at Little Cowarne Court for my Nanas 85th birthday celebrations with all of the family coming from all around the country. The house was beautiful and met all of our needs! Plenty of space for everyone to eat together and living room for everyone to convene and a BBQ if it is sunny. It was very peaceful, we didn't see or hear anybody the whole weekend and you are left to enjoy yourselves in the house. There is plenty to do around the area, with Westons Cider Mill only 25 minutes away it was a great afternoon out! We would definitely recommend the house to groups wanting a simple country getaway. We recently stayed at Little Corwarne Court for my sister's hen party. Sarah was incredibly accommodating and very helpful. The house and the surroundings were idyllic! And the whole place was perfect for what we wanted. Constant hot water (which we were worried about because of how many of us there were), plenty of resources for us as well. The house was clean and tidy and everyone had a fantastic weekend! Booked alongside stables and Little Cowarne Court - perfect accommodation for our mini-conference in a gorgeous part of the country too. Plenty of kitchen accessories, good number of bathrooms/toilets, large lounge good for our projector! Food at Wheelwrights in Pencombe and Three horseshoes pub in Little Cowarne both recommended for their very friendly service too - used BBQ area also perfectly located near kitchen. Four families meeting to celebrate some significant birthdays! First impressions were exciting. Loved the location and the farmhouse. Everything we might have needed was supplied - particularly when feeding sixteen people. Great spaces inside and out, to sit and talk or go and explore. Every-one thoroughly enjoyed themselves. The one negative would be squeaky bed frames in two bedrooms and a ill-fitted floor that was noisy too. We comfortably slept and seated 17 people at the cottage for the Christmas week and were very happy with the facilities. Lots of cupboard / fridge space also. 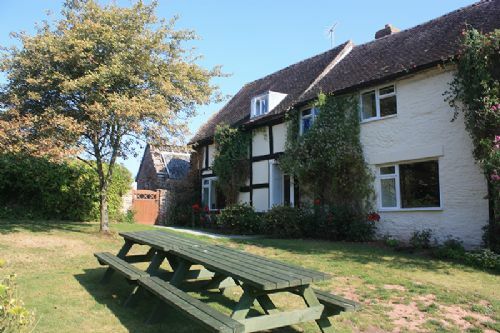 It is a rural location but within a short drive of Hereford and walking distance to the local pub. A great place for family reunions and would like to see it in summer. Some of the interior is a bit worn - but also good in a way as we were not constantly checking the kids are not scratching the floors etc. A nice garden for the kids to have a run around in. The games room is unheated, so not practical in cold weather. Sarah was very friendly and helpful and responsive to email questions. Booking was simple, good instructions to find the property. Helpful advice on the area & make up of the bedrooms. Plenty of towels & loo roll. The house was clean & excellent for our needs. Kitchen was great, with decent knives (rare in a holiday cottage!) and a massive table to get together & chat. Large, comfy living room with plenty of sofas & tv/DVD. A shared games room is just outside. There are other holiday cottages across the courtyard which would be great if you have more friends or family who wanted their own space. The cottages are not cramped together or overlooked. Stairs are a bit steep - might be tricky with very little ones (no problem for our 5+year olds) - but there are downstairs bathrooms & bedrooms if this is a problem. We had a family celebration and everyone, both old and young loved the cottage. It was clean and very comfortable and we would certainly come again. The garden was lovely and everyone enjoyed the playbarn. Thank you for a lovely stay at little cowarne court. The place was perfect for our stay. We will be returning! The house suited us very well for attending the Bromyard Folk Festival which was only a 15 min drive away. The house and garden are charming with old beams, lovely white cotton bed linen etc. Sarah even left us a bottle of wine on the table - very welcoming. We had a lovely week at this property. The kitchen is great and really sociable, the walks around lovely and the garden and games room great fun. I do feel that the property needs a little bit of TLC and a good clean, then it would be perfect.